If you are in the mood for a sweet and creamy ice cream treat that will transport you back to your childhood cake batter- spoon licking days . . . then this is for you. 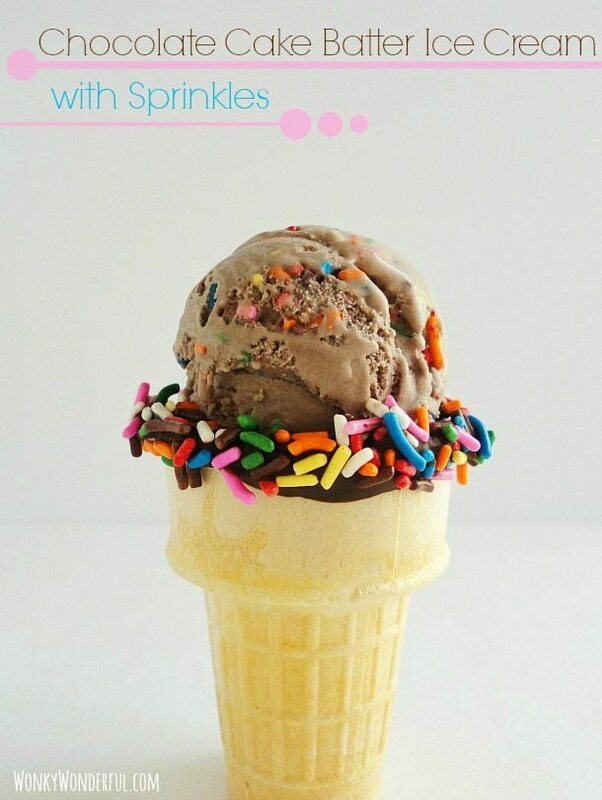 Chocolate Cake Batter Ice Cream with Sprinkles! Yes I have gone to the dark side. Mixing dry cake mix, heavy cream, sugar and sprinkles together in one sinfully delicious dessert. But as you can see in the photos, a little bit goes a long way. I’m not piling three scoops on top of this cone. Just one mini scoop will do ya just fine! I conjured this recipe on a day that I had a house full of kiddos. I always keep a box of cake mix in my cupboard for emergencies. You know … Cake Emergencies! So, I figured I would use some of my emergency cake mix to make the little ones happy. And boy were they Happy! This has been their favorite ice cream flavor so far. I’ll try to take that as a compliment and not an insult. This ice cream was something I tossed together without much thought. My other ice cream recipes have been meticulously planned and a lot of time was spent adjusting the ingredients and flavors to get them just so. Maybe it is a sign that I should: Keep It Simple, Stupid! Nah, I still prefer my grownup ice cream flavors. But this was a nice change and a fun treat. Don’t have an ice cream maker and don’t want to buy one? No problemo, here is my tutorial on the 3 Methods For Homemade Ice Cream. Mix the cream, milk, sugar and cake mix together. I used an immersion blender to get it fully incorporated. Place your desired ice cream container into the freezer. Churn the cake batter mixture in an ice cream maker according to the manufacturer's instructions. Once the mixture is frozen and creamy, transfer to the cold ice cream container. Add the sprinkles and stir to distribute throughout the ice cream. Cover and freeze for at least 4 hours before serving. Stir chocolate chips until melty and smooth. Dip cones first in the melted chocolate, then into the sprinkles. This recipes yields about 3 cups of ice cream. 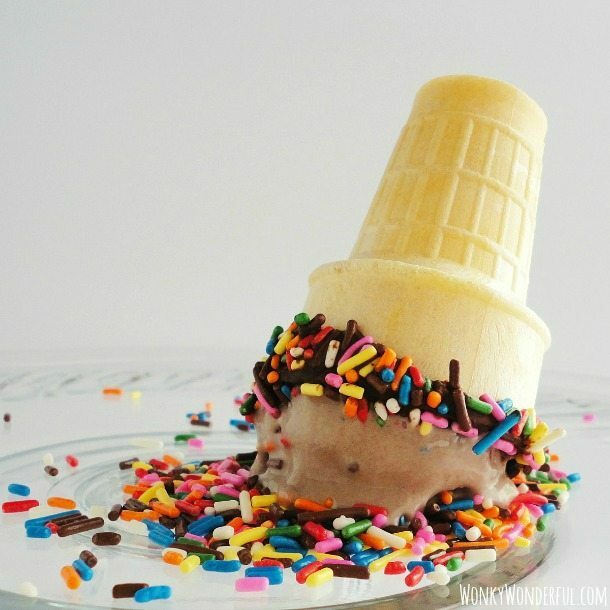 I absolutely adore ice cream and this recipe looks like a must try! I am always looking for new recipes to try in my ice cream maker that are not to difficult, especially ones that you do not cook! Thanks for the recipe! Hi Allie! I am ice cream obsessed! Honestly, I hardly ever make the type of ice cream that requires cooking. Who wants to wait for the liquid to cool overnight!?! OMG Nicole. This looks fabulous! Yes, I want this right now! Pinned! Thanks Julie … and thanks for pinning! Have a wonderful week! Your recipe looks amazing! Your pictures are great too. Definitely making this for my kids one day. Thanks so much for sharing! Hi Brandi! Thanks so much for the compliments! I hope the kiddos enjoy. Have a fantastic week! Love this recipe! I’ve made cake batter ice cream with white cake mix, but have never seen it done with chocolate cake. Pinned. Hi Jelli! 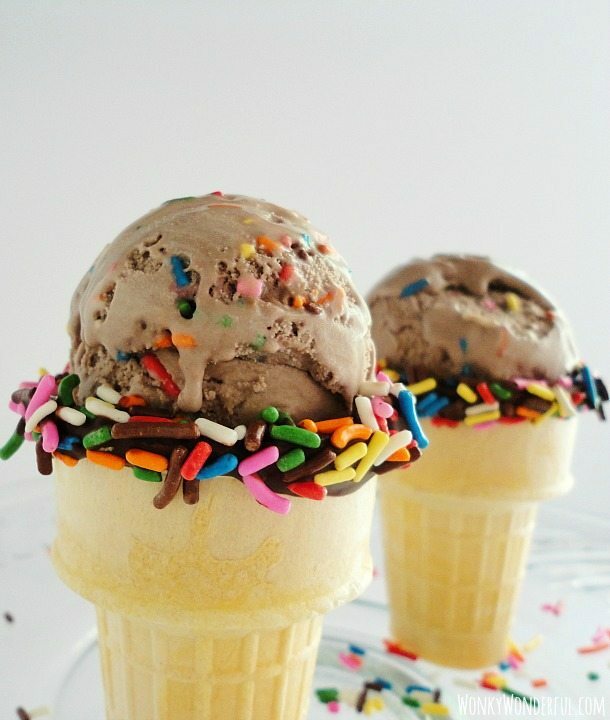 I’ve never made ice cream with white cake mix … I always go with chocolate! Thanks for pinning. Have a wonderful week! I like kiddie flavors and adult flavors of ice cream alike. I think this is one that would definitely go over well in our household! Thanks so much for the compliments. Have a wonderful weekend Erin! This looks so nice!! definitely need to make this! That looks so good, can I have some. I’m featuring you! Thanks for sharing at Thursdays Treasures. I love cake batter ice cream, never had chocolate cake batter ice cream though! I’ll definitely have to give this one a try. I don’t think that there is much that tastes better than cake batter!! Haha, Thanks Chelsea! … I would never judge for that. I’m always drooling all over my keyboard! i want to make this but want to know how does it tastes like,does the taste of flour prominent , actually i havent tasted this kind of icecream before. sorry for my silly question. thankyou for your reply , i am certainly going to make it. thanks again. Its okay , thanks once again you took out time to reply me. but the cake mix is uncooked and has flour, baking powder and eggs which is all raw. wouldn’t it upset the stomach? does the heavy cream have to be whipped? Nope. You do not need to whip the cream before churning. Enjoy! I made this at my home.Really awesome recipe.Thank you for sharing such a wonderful recipe.